Among the remarkable masterpieces of liturgical art, a tall implement developed in XVI c. Spain, the custodia, holds a special place of privilege. 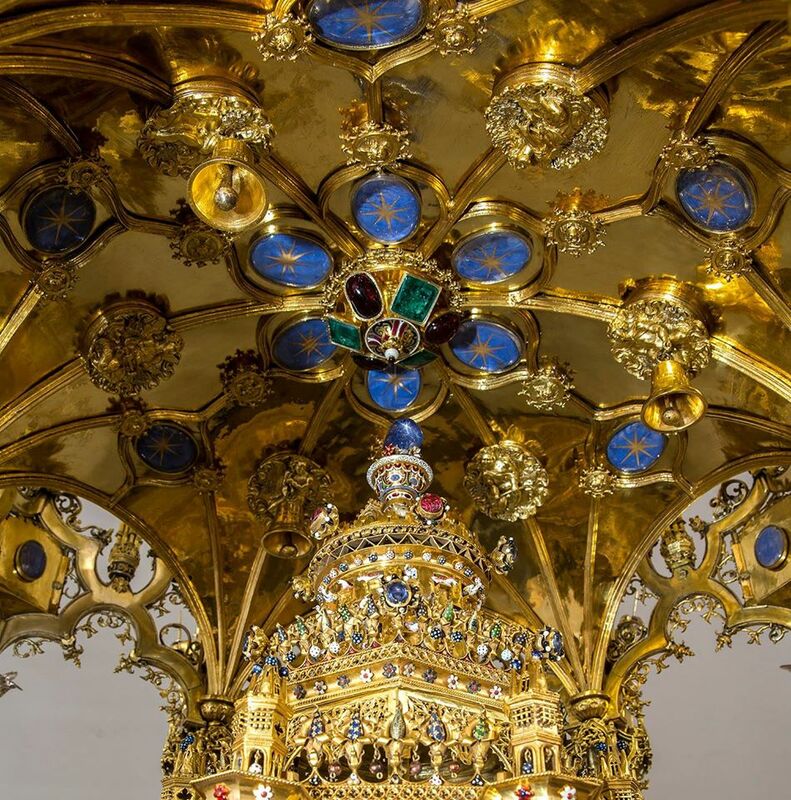 At once a canopy, a tower, and a bier, the custodia is intentionally conspicuous, dramatic, and somewhat otherworldly in appearance with soaring architectural structure and complex design. A miniature edifice and an unusually large artefact, it is meant to enshrine a monstrance during Eucharistic processions. 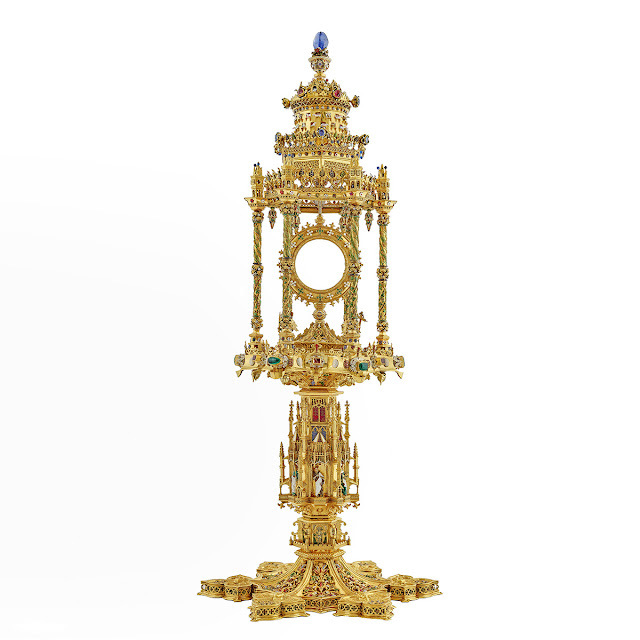 The most outstanding of these liturgical implements is the early XVI c. magnum opus conceived and crafted by master goldsmith Henrique D’Arfe for the Primate Cathedral of St. Mary in Toledo, Spain. The Arfe Custodia is one of the most impressive artworks inspired by the liturgical celebrations of the Church and also one of the first of its kind to be commissioned. The Archdiocese of Toledo and its cathedral maintain respectable archives and reliable information is extant about circumstances of their numerous artistic commissions. The great cathedral was completed around 1495 after almost two hundred years of continuous planning, building, and expansion. During its long development it has become a major pilgrimage site, an important catechetical and liturgical locus, and a significant artistic center. In 1504, Queen Isabella of Spain had died and her enameled and gem studded, solid gold, Gothic ostensorium became available. It arrived in Toledo after a private transaction between the estate of the queen and the Archdiocese of Toledo. Cardinal Ximenez de Cisneros oversaw the transfer of the ostensorium to his diocese and almost immediately initiated a design competition for a custom custodia that would be worthy of this magnificent acquisition. Three goldsmiths submitted draft entries. Henrique D’Arfe was awarded the prestigious commission. Since the late Middle Ages artists began to intentionally settle close to important religious and artistic cities to advance their talents and secure new assignments. By the beginning of XVI c., it is recorded that about five hundred goldsmiths were actively employed around Nuremberg alone. Understandably, competition for work was intense, while guild associations for artists implemented steep crafting standards for all art mediums. Highly skilled artists often found themselves travelling in Europe in search of new patrons and new opportunities. Henrique D’Arfe arrived from Cologne to Toledo not too long before competition for the custodia was announced, possibly to open a workshop in the vicinity of the newly completed cathedral. He was a gifted and accomplished goldsmith by the time he moved to Toledo. In XV c. and XVI c, goldsmiths were trained to draw, work with miniatures, mold precious metals, cut gems, realize sculpture, paint, carve relief, understand architecture, and master popular metalsmithing techniques such as enamel and niello. The plan that Arfe submitted for the Toledo competition is a telling mark of his remarkable aptitude and his mastery of the goldsmithing craft. He won the prestigious design competition and then moved on to craft this magnificent design by himself over a period of about nine years, discovering solutions and developing techniques for constructing his awe inspiring edifice in the process. The Arfe Custodia is an eight feet tall structure crafted from 388 pounds of pure silver, constructed from 5,600 parts and 260 statuettes that are assembled by means of discreet screws and wires. Charged with caring for the custodia, silversmith Vicente Salinas (XVI c.) found himself compelled to compose a special treatise about this complex arrangement. The historic text illustrates and explains how to dismantle and reassemble the great tower for cleaning, repairs, plating, and other restoration work for all of its pilasters, flying buttresses, arches, bells, brackets, canopies, and vaults. The greatest challenge is of course, the reassembly. 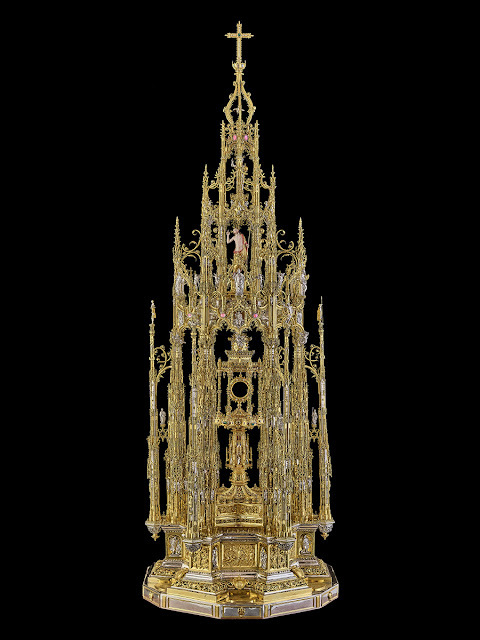 The style of the structure is Flemish Gothic, intricate and dense, but it also incorporates Renaissance motifs and features such as classically inspired figure modelling, relief work, and design with strategically located apertures that enhance the lace-like quality of the structure but lend it a sense of harmonious composition. The design is organized on a prominent central vertical axis that is grounded in a middle of the solid foundation of the base and which soars beyond the cross at the top. Despite complexity, none of the many parts of the custodia strike the viewer as superfluous. Especially noteworthy is the figure of an elegant Botticelli-style Risen Christ. The open expanse of Our Lord’s chest, naturalistic coloring of the flesh with enamel, curving line of posture, extended arms, as well as ease of pose lend this figure a definitive Renaissance manner. The custodia is a three-tiered structure arising from a hexagonal base adorned with bass relief scenes from the Gospels. The second and middle section is reserved for the ostensorium. The top narrows and culminates in the Cross. 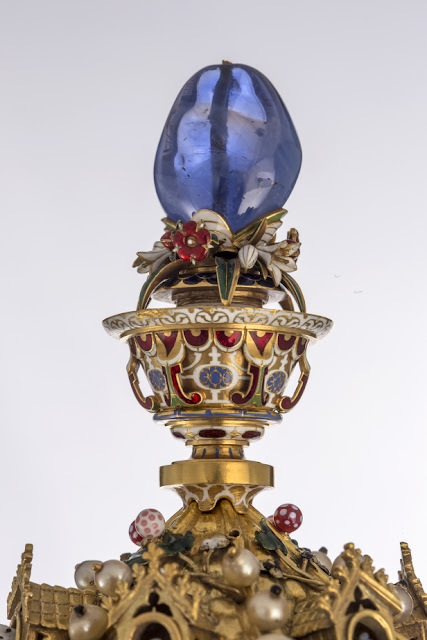 The ostensorium and the luna acquired from Queen Isabella’s estate are Gothic, made from 38 pounds of solid gold, and crafted according to the French manner characterized by highly decorative use of gems, colorful enamel detailing with stylish white enamel accents, and the addition of miniature enameled sculptures. 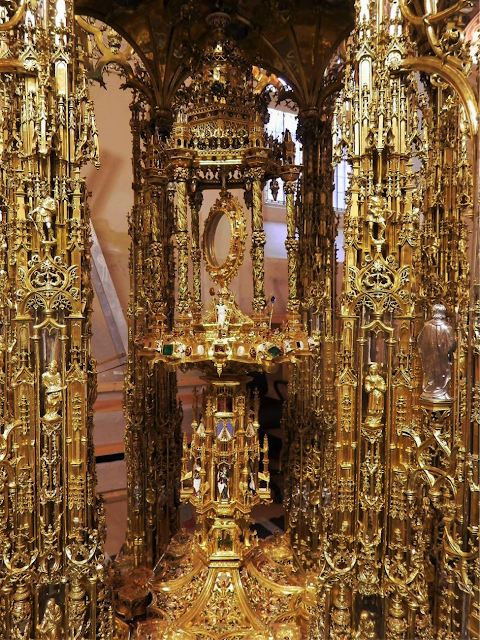 In comparison to the ostensorium, the custodia is a stylistically more transitional liturgical implement despite its apparent and decisive Gothic influence. It is architectural and functional. While it incorporates statues and reliefs, it is somewhat somber, having been originally silver-finished with a less manifest use of gems and enamel. Perhaps the most telling characteristic of the Arfe composition is its iconographic emphasis on the Incarnation as the key event in the economy of Salvation, summed up and celebrated in the Eucharistic Presence. The design accomplishes this catechetical feat by placing the figure of Risen Christ above the center and in direct line above the ostensorium. Above the figure of Christ is a figure of the Holy Infant as King, holding a globe surmounted by a cross. At the top of this central figurative axis we find a representation of the Holy Spirit shown as a dove. The ostensorium with the viril (luna) is in a direct line below the figures. Looking at the custodia, one finds that there is no single point of visual reference and that the design necessitates a vertical eye movement from the ostensorium to the figure of the Risen Christ, to the Infant, to the Dove and finally to the Cross at the top. This strong figurative axis creates a sort of visual expose of Catholic faith in the Eucharistic Presence. The Restoration Department of Granda, a liturgical arts workshop in operation since 1893, was entrusted by Spain’s Institute of Cultural Heritage and Patrimony with the restoration of the Arfe Custodia between 2012 - 2016. 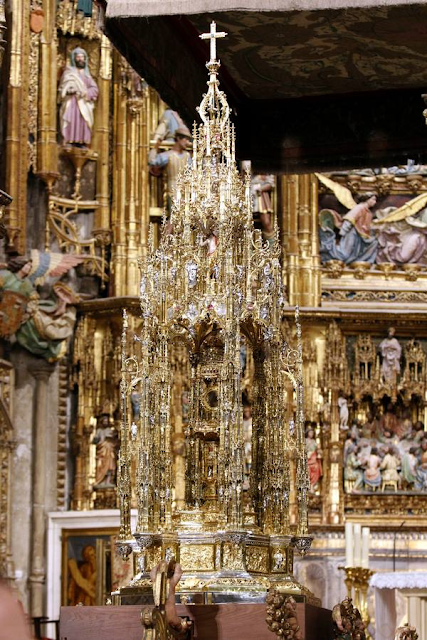 The restoration work was carried out on site at the Cathedral in Toledo and partially in Granda’s workshop in Alcala de Henares, near Madrid. The treatise of Vicente Salinas was used to decode, disassemble, and then re-assemble the great Custodia during a lengthy and meticulous restoration process. The restoration endeavor ensured that this amazing piece of Catholic artistic heritage continues to be, in a phrase coined by St. Bonaventure,‘super-wonderful.’ The cathedral’s historic ostensorium and Arfe’s Custodia have been in liturgical use for the Solemnity of Corpus Christi since the beginning of the XVI c.
Link, Eva M. The Book of Silver. Praeger Publishers, 1973. Catedral Primada Website. La Custodia.